The Scottish government is to seek devolution of drugs laws to allow users to take heroin safely under medical supervision. A "fix room" was planned for Glasgow because of an increase in street injecting in the city, and a rise in HIV infections among users. Scottish ministers said the idea was "ambitious and innovative." But the Home Office, which controls drug legislation, said it was illegal, and expected police to enforce the law. The safer drug consumption facility (SDCF) was planned for Glasgow where an estimated 400-500 drug addicts are injecting on the streets. The city's health and social care partnership (HSCP) said this potentially put the users and the wider public at risk. It proposed to allow drug users to inject or smoke their own heroin without fear of arrest in the SDCF. Medical staff and drugs counsellors would have been be on hand. But those plans have stalled, despite backing from the SNP which voted at its annual conference in 2017 to treat drug addiction as a public health matter rather than a criminal justice issue. 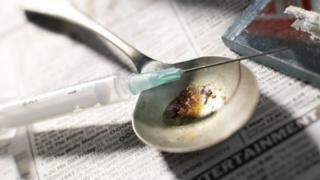 A Home Office statement said: "We have no plans to introduce drug consumption rooms. "A range of offences is likely to be committed in the operation of drug consumption rooms. It is for local police forces to enforce the law in such circumstances and, as with other offences of this type, we would expect them to do so." Glasgow's HSCP had requested guidance from Scotland's senior prosecutor, the lord advocate, about the possibility of a "Letter of Comfort" being granted to rule out any possible prosecution arising from the SDCF. But he said his hands were tied. He said if the SDCF was established, its board, the city council and staff at the premises would be likely to be committing an offence under section 8 of the Misuse of Drugs Act 1971, and the lord advocate could not affect that. A Crown Office statement said: "In short, the lord advocate could not render the operation of the facility lawful." It went on: "In order to render the proposed SDCF lawful, it would be necessary to obtain a further exemption from the Misuse of Drugs Act 1971. "The subject matter of the Misuse of Drugs Act 1971 is reserved to the UK government. "The question of whether or not to amend the regulations, or to give the Scottish government power to amend the regulations, in order to support the proposed SDCF would accordingly be a matter for the UK government." Public Health Minister Aileen Campbell said she had called on the UK government to devolve drugs laws to Scotland to help tackle a serious public health problem. She said: "The recent efforts to introduce an SDCF in Glasgow is an example of how ambitious and innovative responses are being generated at the frontline where we see stigma challenged and a huge public health problem responded to in a way that meets the needs of that population. "The law does not currently allow that facility to proceed but we must not let that be the final word on the matter. "I have written to my UK counterpart to ask for discussions on how this parliament obtains the powers to allow us to meet a significant public health challenge." David Liddell, chief executive of the Scottish Drugs Forum (SDF), said the timescale for establishing the drug consumption facility would now slip considerably. He said: "It's hugely disappointing. We've got such a massive problem in Scotland, and obviously particularly in Glasgow in terms of such a high rate of fatal overdose deaths. "And in Glasgow that's combined with an active outbreak of HIV infection among injectors, so it's incredibly disappointing for all of us who have pushed for this initiative and other similar initiatives across the country." In 2016, 170 drug-related deaths were recorded in Glasgow - from a record total across Scotland of 867. The previous year there had been 47 new diagnoses of HIV among those who inject drugs, compared with a previous annual average of 10. NHS Greater Glasgow and Clyde (NHSGGC) published "Taking away the chaos," a review of the health needs of those injecting drugs in public places. It said: "Public injecting in Glasgow is concentrated in lanes, closes, car parks, and public toilets of the south-east city centre and adjoining areas of the east end. "Several informal drug consumption areas have been found in abandoned buildings and makeshift huts." A spokesman for Glasgow HSCP denied the plan had stalled, but said an update would be presented to the partnership's Integrated Joint Board in due course. He said: "We are continuing to work on our proposal to open a safer drug consumption facility in Glasgow. "We have had initial discussions with the Scottish Government on how we can best secure the legislative framework needed to ensure the facility can open legitimately." Are UK drug consumption rooms likely?